Lamberts powdered Myo-inositol is 100% natural and affords an easy and convenient way to supplement the diet. 4g of powder daily can be added to water or fruit juice and stir, or as directed by a practitioner or pharmacist. 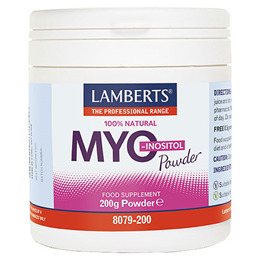 Below are reviews of LAMBERTS Myo-Inositol - 200g Powder by bodykind customers. If you have tried this product we'd love to hear what you think so please leave a review.